Artemis Rising 2 is go! The first stories are up and I’ll run a roundup of them here next week. Know what else is up? This amazing work by Galen Dara was commissioned specially for AR2. We love it and we’re delighted to be able to offer it for sale until March 31st through Society 6. Go pick it up now. Hugo season is on us and nominations are now open. 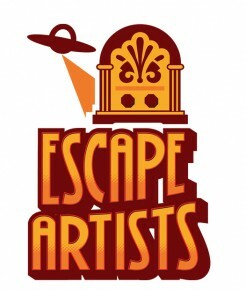 Every Escape Artists show is eligible under Semiprozine and the details of what episodes you can vote for, as well as several very useful lists for the other categories can be found here. An every day story of hypochondria, linguistic degrees and the true colour of a moped. Oh also evil cars. And a space station. And brain worms. Jen’s story throws a dozen ingredients into the pot in a way that seems chaotic right up until everything drops into place. It’s clever, very funny science fiction and the reading is absolutely the text’s equal. JS manages to be laconic and cool and panicky and frantic all at once. Very weird and very funny. A sprawling cast with some welcome familiar faces really brings this story to life. Martha Wells excels at this sort of just-inside-polite intrigue and the story moves with the same measured poise and grace of the Opera cast. It’s a hard working story with a hard working cast, all perfectly in tune. Check it out. Podcastle has reopened to submissions! Go read the guidelines and submit! All of which is great and absolutely worth your time. Especially Sunil’s Hatoful Boyfriend piece. You can get MZ direct from us via payhip, through Smashwords and Amazon and click here to subscribe for just 10 bucks a year. Staff Picks month continues at Cast of Wonders with a couple of absolute doozies. Episode 193: Princesses do not Breathe Fire by Sarina Dorie, read by Jeff Hite and family and picked by Jeff Hite. Like every other member of the CoW team Jeff is a fiercely good host. His endcap here really educated me and he’s absolutely right; this is a story that has so many layers Donkey from Shrek would listen, enjoy it, get hungry for a parfait and then go order ten. It’s a very funny story about a Princess making her place in the world. It’s a romance. It’s a subversion of fantasy tropes. It’s a story about disability and body image. It’s all these things and a dozen more. It’s also wonderfully read by Jeff and several of his kids. Enjoy. My favorite story this week and also one of the most carefully balanced. This is a story about first contact. It’s also a story about how comforting conspiracy theories are and how awful it can be when they don’t turn out to be true. It’s also a story about death, and life, and the power of small kindnesses. Read with typical delicacy by Stephanie Morris it’s a hell of a story and a great pick from Sally. It also continues CoW’s 194 (and counting) episode crusade to show just what a vast spectrum YA really is. And that’s the EA week. As always, our back catalogs are available for free, do click through and explore there’s amazing stuff in there. Also, as ever, we rely entirely on you to pay our authors and cover our server costs so if you like any of these stories, please donate or subscribe. Click on the banner art for each show above and it’ll take you right there. See you next week.